Wascomat On-Premises Laundry Washers come in various extraction speeds ranging from 100 G-force to 450 G-force extraction. They are designed for efficiency, superior wash results, ease of use, and low water and energy consumption. You will see lower utility costs and higher productivity. 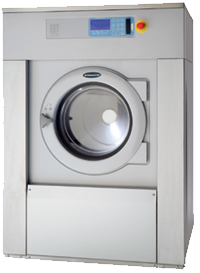 Wascomat’s EX washers are designed for efficiency and superior wash results. The high G-force extraction cuts drying time resulting in lower utility costs and higher laundry room productivity. Plus, Wascomat EX washers are soft-mounts and easy to install anywhere: on wood floors, upper levels, and over basements.